The narratives around mental health in the arts can often feel misguided – shows such as Dear Evan Hansen and 13 Reasons Why harbour downright harmful ideas by romanticising illness and using it to excuse sociopathic behaviour. Where Original Death Rabbit soars triumphantly above this mire is by crafting a story that’s about mental health, but in a hugely multi-faceted and culturally resonant way that is intellectually mature and gleefully silly. Original Death Rabbit is a one-woman show featuring Kimberly Nixon as the titular Death Rabbit (her real name is never revealed) and written by Rose Heiney. Death Rabbit details how being photographed at a funeral in a rabbit onesie turned her into an internet meme, and how becoming intrinsically entrenched within the validation-seeking spheres of Twitter and sites like Buzzfeed had devastating long-term effects on her psychologically. If that all sounds a bit heavy, don’t worry – Heiney’s script is brimming with sharp fiery wit and mounds of one-liners that inject a very human sense of levity into the proceedings. The big ideas are smartly concealed amongst eclectic plot threads, such as online forums about Richard Curtis films, and an obnoxious friend named Penny. The script’s perfect blend of reality and theatricality is aided in no small part by Nixon’s masterclass of a performance that captures the ostensible ‘if you don’t laugh, you’ll cry’ desensitised attitude of the millennial generation to a tee, but also lets the cracks in this mask show at very precise and poignant moments. 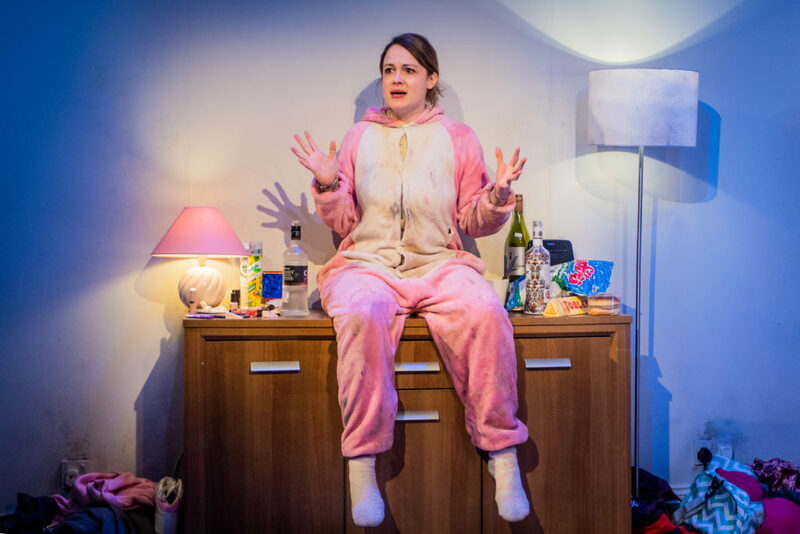 The relatability is heightened further by Louise Whitemore’s set – Death Rabbit’s exquisitely unkempt flat, littered with dirty clothes, microwaveable burgers, and spots of damp in the walls. Director Hannah Joss has tied together flawlessly every element to paint the reality of how it feels to be a part of the society that struggles to get by but feels obligated to depict immaculate lives on social media. Eleven days in, saying Original Death Rabbit is the best play of the year doesn’t seem like particularly high praise, but I’m confident that twelve months down the line, this extraordinary piece of theatre will still be a contender. If this is any indication of the storm that the intimate Jermyn Street Theatre is brewing up for its 2019 output, we should all be very, very excited.